When I make a pudding like this, I'm reminded that a fine-mesh sieve is my best friend in such an endeavor. You'll be able to strain out (and leave out) any inevitable bits of cooked egg to get a nice, smooth and silky pudding. I recommend being patient and cooking the pudding under medium-low to low flame. As I said, I should have cooked my pudding a few minutes longer for a thicker consistency. I recommend making the pudding a day ahead so it has plenty of time to chill in the fridge. I found it very tasty when it's nice and cold. There's so much chestnut flavor and I also loved seeing the specks of vanilla beans and tasting it in the pudding. 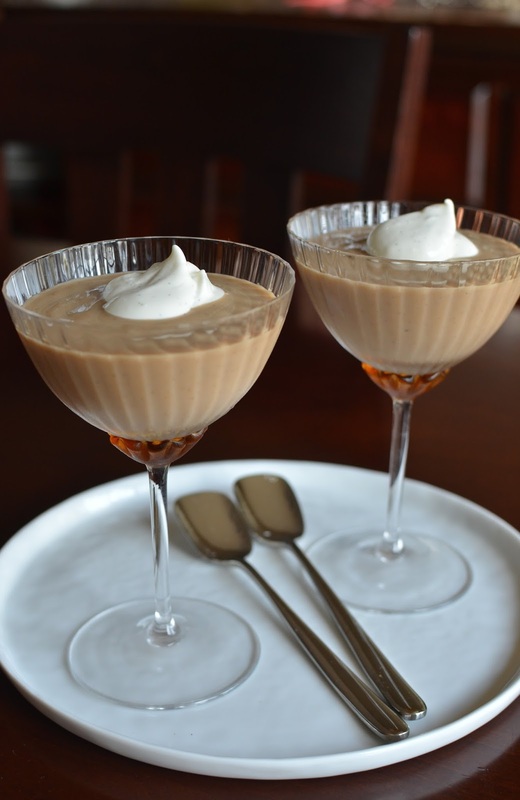 A topping of vanilla-bean whipped cream makes it a bit more luxurious...it's lovely, and just a little goes a long way. I might love chocolate but I think I'd swap my chocolate pudding for this chestnut one if asked to choose! Now I had leftover chestnuts from the jar I opened for this. I was tempted to make another batch of this pudding but with all the Christmas cookies to be baked and eaten, I decided to go the savory route and made a pot of chestnut soup! Place chestnuts and milk into a blender. Split open the vanilla bean and scrape about three-quarters of the seeds out using a sharp paring knife (reserving the rest for the whipped cream), adding it to the chestnut and milk. Puree until very smooth, about 2 minutes or so. In a medium saucepan, whisk the sugar, cornstarch and salt together. Whisk in the egg and egg yolk next. Stir in the chestnut milk mixture and bring to a low simmer, cooking under medium-low heat while stirring or whisking constantly. Continue until bubbles break the surface of the pudding and it thickens, about 8 minutes. Remove pan from the heat and stir in the butter and vanilla extract. Strain the pudding through a fine mesh sieve into a bowl. Cover the pudding by placing a piece of plastic wrap directly on top of the pudding. Let cool and refrigerate until thoroughly chilled. Before serving, whip heavy cream with the reserved vanilla bean seeds (as well as a touch of sugar and vanilla extract, if desired) just until semi-stiff peaks form, when cream is still pillowy soft. 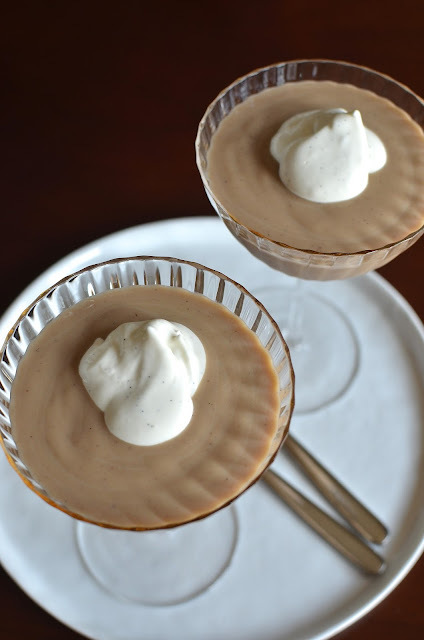 Divide pudding into serving bowls and top each with a dollop of vanilla whipped cream. I too love chestnuts, but hardly use them in a dessert. This is a great recipe to start with. Your pudding looks great, Monica. Thanks, Angie. 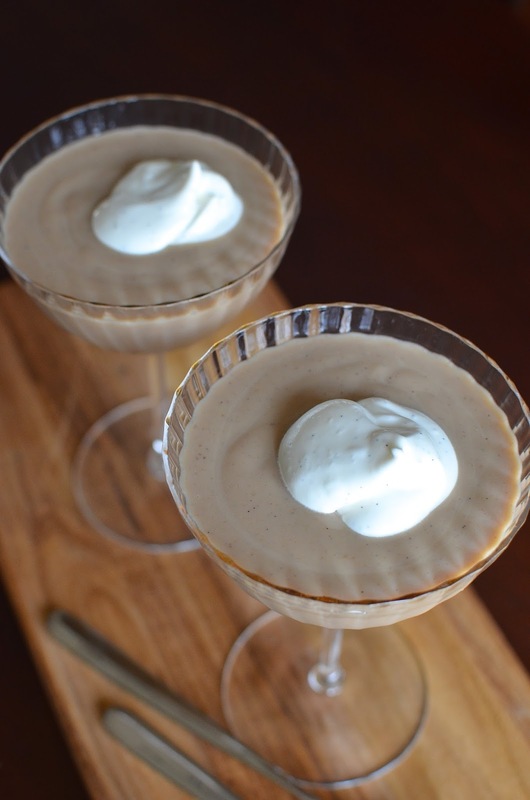 I couldn't pass up such an easy way to make and enjoy a chestnut dessert. The flavor's great!! 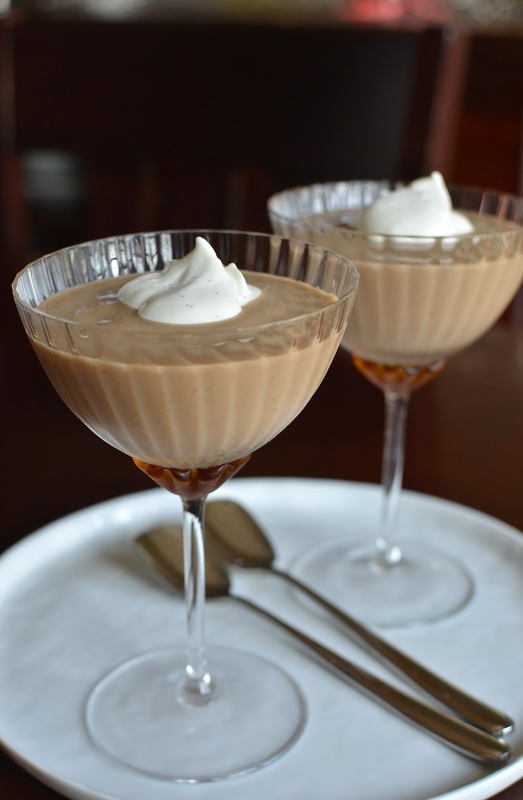 I have never had a chestnut pudding yours looks gorgeous and there seems to be 2 spoons so I need to join you! LOL I bet this is a welcome creamy dreamy change from all of those cookies. Wishing you and your family a super holiday. Thanks for swinging by, Bam! This was a treat and a nice break from cookies, though cookies are magnificent! : ) Hope you are having a great holiday season - all the best for a wonderful 2016! I have never had such pudding! But sounds interesting and looks creamy and very yummy! I always think of you Monica whenever I see chestnuts in the store (or a recipe with them!!)! This pudding looks just delicious. I love that it uses a vanilla bean! Such a lovely recipe. Looks so beautiful and amazing clicks dear! I AM SO FRIGGIN OBSESSED WITH CHESTNUTS! BEYONDDDDDD obsessed! I think you would enjoy it, Lorraine. It's so easy and tastes really good. I LOVE chestnuts. This chestnut pudding sounds great! I bought some fresh chestnuts yesterday and cooked it up since I hadn't bought fresh in a long time...unfortunately, it wasn't a great batch but I still love chestnuts! The pudding was great. yum! pudding looks amazing! I'd die to have it NOW! Thanks, Marcela. Hope you have a good holiday! Ooooh! A chestnut pudding! Looks absolutely scrumptious! It was really tasty, thanks! I am so curious about this --- I love the idea of chestnuts, but I've rarely ever had them. I actually bought some to roast this year but I didn't get around to it. The color and texture of your pudding looks wonderful! I confess I never could roast chestnuts properly and just boil mine when I buy it fresh. I cook fresh ones less and less but an easy recipe like this, where I can use pre-cooked chestnut, is just great. The flavor is just like that chestnut part of a mont blanc. I am so impressed with your chestnut recipes but I have never tried making anything with chestnuts. 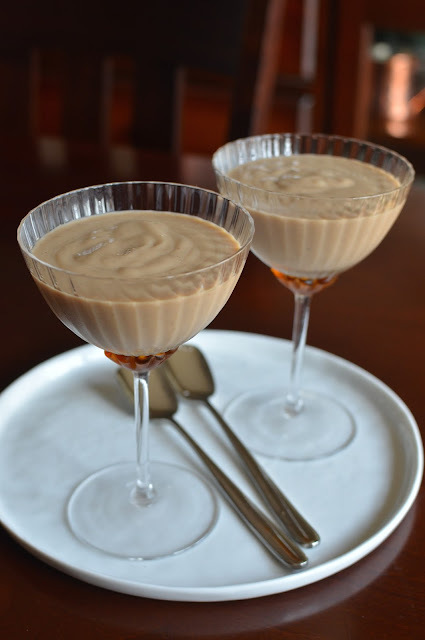 You have inspired me and I love this pudding - the color, the presentation, and the texture looks great to me! Merry Christmas Monica! Thanks, Tricia. I feel like all chestnut based desserts are such a treat. I really love it. This pudding was really enjoyable. Christmas is almost here! Have a great one with your growing family! What a lovely way to start the year, "I resolve to make pudding over and over until it is JUST right!" :) However, I must say that your photos and description make your pudding look "just right" right now! Happy, healthy, peace-filled Christmas, Monica! haha - Wendy, I resolved not to be a perfectionist a long time ago and apparently, I now follow that mantra a little too well...so I'll be more mindful in my pudding-making in 2016 but I doubt I'll be able to get it just right any time soon. : ) Hope you have a wonderful holiday surrounded by loved ones! This looks terrific - and I love the idea of serving it with meringue cookies! Yes...I think that would complete the mont blanc theme even more. : ) Have a wonderful Christmas with your family, Beth. I would just cook it a few extra minutes and thicken it some more next time...but it was so tasty and easy.